Are you ready to ditch your gym dread and make exercise a daily habit (that sticks)? 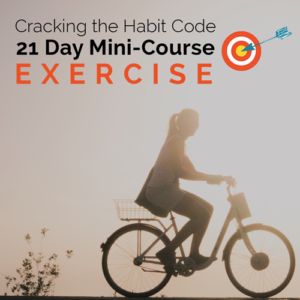 The Establish an Exercise Habit Mini-Course by Dr. Christine Carter will teach you how to make exercise an enjoyable habit in just 21 days. You’re only 21 days away from making exercise a fun, enjoyable daily habit. Regardless of your age or fitness level, this 21 day mini-course will give you research-proven steps to help you make exercise a daily routine that will last a lifetime. You’ll turn your “I REALLY should be doing this!” workout activities into behaviors you do automatically. • 21 Days of Material (+ Additional Resources): All 100% self-paced and mobile-friendly, you’ll receive a daily check in via email from Dr. Christine Carter where she’ll go over the course material for that day. • Automatic Progress Tracking: Designed to help keep you on track to complete the full program, you can easily see which material you’ve completed and which you still have left to enjoy. • Insider Tips: Avoid common brain booby-traps that make it difficult to stick to a routine. • Downloadable Workbook: The place for you to track your thoughts and progress throughout the mini-course. • Private Facebook Group: Receive instant access to Dr. Christine Carter’s private Facebook Group — a 24/7 community for you to meet other students, discuss issues, ask questions, and support each other. • 100% Self-Paced: This mini-course was designed with the busy person in mind! Go through the material as quickly or slowly as you’d like. We recommend spending 10-15 minutes each day for 21 days. • Unlimited Access: Go back and visit the material as many times as you’d like.